Behind the scenes, on the scene, after the scene, if its a scene, people want to see. Just as summer peaks bright with a solar eclipse, entertainer and singer Beyoncé releases a coffee table book, Collectors Edition, How To Make Lemonade Box Set. 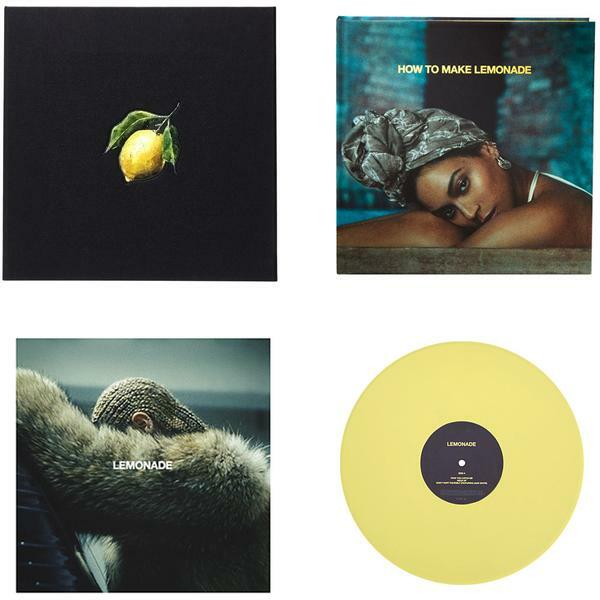 This set is about her life in the scene and out on her Lemonade (2016) journey, including private family moments, outtakes from the artist at work and documentary style reveals through lines penned from her own hand and via lyrics. The 600 page book -includes a foreword by author and Dr. Michael Eric Dyson and poetic lines by British author, activist and poet Warsan Shire. The book retails for $299.99. Depending on how much you spend on coffee a week, say $5 a day, six days a week, that means ten weeks or approximately a summer of coffees equates to adding this to your coffee table. This doesn’t mean the culture is trading Lemonade for coffee, but it does mean it might accompany it. Today marks one month and one day until summer officially ends and fall marks its return. To say summer is in full bloom is a statement full of sunshine, florals, wild grass, ready-to-drink beverages and all the fragrance that comes with these tentacles of the years hottest season. To compliment it, fashion brand Gucci and its campaign film ‘Gucci Bloom’ visually show how beautiful pantones of spicy mustard, potters clay, aurora red and dusty cedar in a floral garden express themselves amidst a summer ‘scape. Because coffee is a flower and tea is a leaf, it is this cultures escape to see it physically among perfume blooms in Gucci Bloom. In coffee, bloom happens when hot water meets ground coffee and carbon dioxide bubbles up as the roasted coffee is brewed. Rangoon creeper? I need to experience this plant, it sounds wild, free and exotic. Coffee likes that, coffee culture welcomes that. In the film, tea is poured alfresco curbside on a street, coffee with latte art appears on a coffee table in an interior room and tea is sipped by women: model, actress Hari Nef, artist Petra Collens and actress Dakota Johnson – in a garden. Doesn’t the culture look beautiful? May it remain #inbloom. 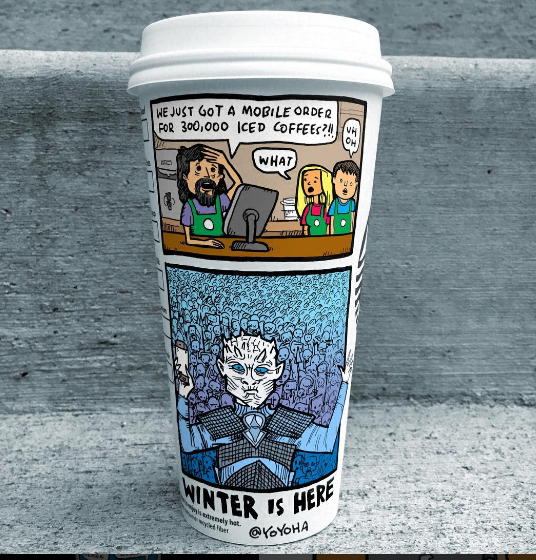 Artist and illustrator Josh Hara has taken the classic form of a comic strip and its sequenced boxes and made a game out of sharing moments inspired by each episode of Game of Thrones season seven and its happenings. While Hara creates cups three times a week covering pop culture topics and personalities, its a fresh take to see him take on the episodic drama that has viewers around the world tuned in, in real time for its airing. Behold the 300,000 iced coffee order. See a full spectrum of his work on sale here. Tune in to GOT, every Sunday, this season, here on HBO. 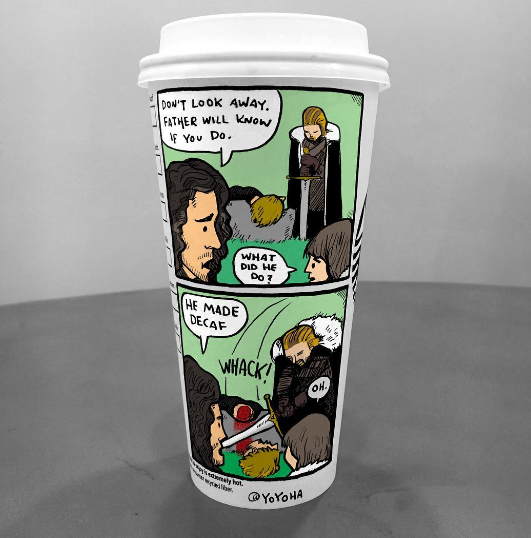 This entry was posted in art, coffee shops and tagged alessandro michele, beyonce, book, coffee table, game of thrones, gucci, hbo, lemonade, michael eric dyson, pantone, warsan shire. Bookmark the permalink.